Olympic Stem Caster Kit includes (4) 5" swivel casters with brakes. Each caster is constructed of durable, non-marking high modulus rubber. NSF listed. One order equals (1) box of four casters. Load rating: 300 lbs. 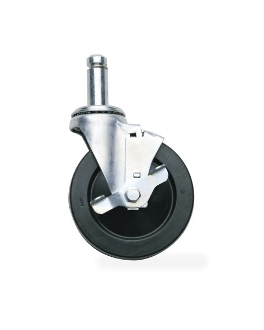 (136kg) per caster. For product specification sheet OLY-005E. Please note that casters add 6" (152.4mm) to the overall height of a mobile post.